This recipe was submitted by Veronica Gantley, from My Catholic Kitchen. Thank you Veronica! 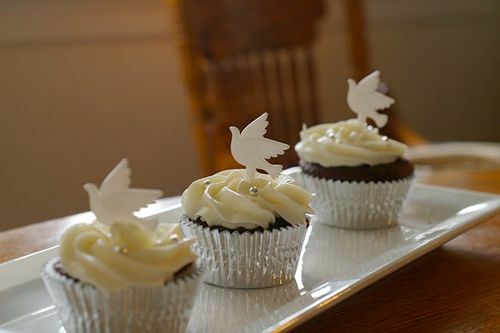 I bought these dove cupcake picks from a cake store a while back, thinking that they would be fitting for Pentecost Sunday, since the doves represent the Holy Ghost. Add cocoa mixture to butter mixture alternately with sour cream, beginning and ending with cocoa mixture. Beat at low speed until blended after each addition. Stir in chocolate chips. Put 12 paper baking cups in a muffin pan. Spoon batter evenly into cups, filling all the way to the top. Bake at 350° for 25 to 30 minutes or until a wooden pick inserted in center comes out clean. Cool in pan 5 minutes. Then transfer to a wire rack, and cool 30 minutes or until completely cool. 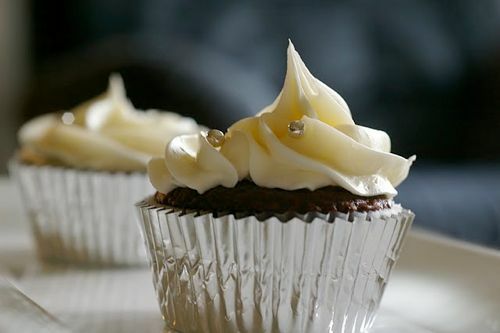 Spread cupcakes evenly with White Frosting. Beat butter with an electric mixer with a paddle attachment at medium-high speed until creamy. Gradually beat in sugar until smooth. Beat in vanilla and 2 Tbsp. milk, adding additional milk, if necessary, for desired consistency. Note: You can often find dove picks and decorations in the wedding section of the craft store. Additional recipes for Pentecost Sunday can be found in the archives! Thank you so much Jessica for being so kind and posting my cupcakes.